Some models of Frigidaire washers come with a digital readout display that informs the operator of the unit's function and any errors. Error codes indicate that a problem has occurred and should be addressed. 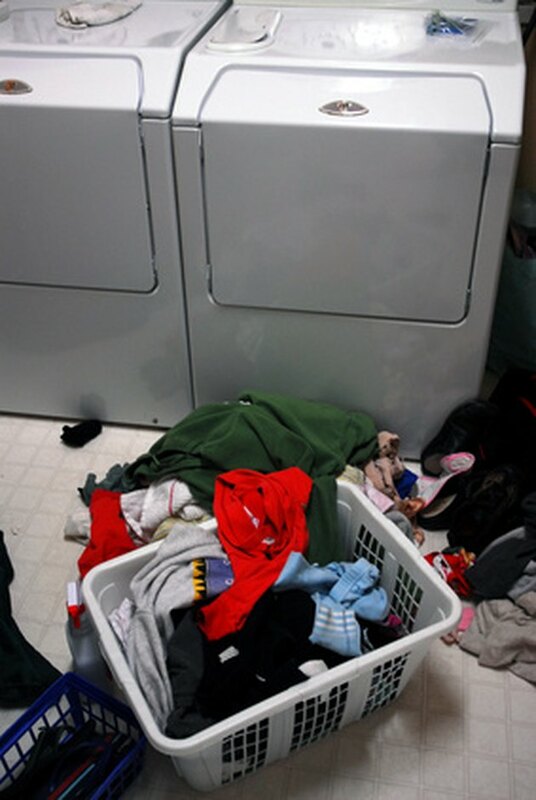 Different models of Frigidaire washers may vary in their fault displays. Some washer models use flashing lights at the unit's start, door lock, wash, rinse, final spin and control indicators to display error codes. Frigidaire washers use error codes to alert users of problems. For washer models that do not have a digital display, the five indicator lights of Door Lock, Wash, Rinse, Final Spin and Control will flash the number of times for the first digit of the code. The Start indicator light will flash the number of times for the second digit. All error codes start with the letter "E". An error code of E11 will have the five indicator lights flash once and the Start indicator light flash once. If the five indicator lights flash more than nine times, this signals a letter in the error code. The letter "A" stands for 10 flashes, "B" for 11, "C" for 12, "D" for 13, "E" for 14 and "F" for 15 flashes. An error code of EB2 will have the five indicator lights flash or blink 11 times, and the Start indicator light blink twice. The following messages are for error codes that range from E11 to E59. E11 means the washer fill time is too long. E13 is for a water leak in tub or air leak in air bell. E14 equals a reed switch problem. E21 means the water is not pumping out fast enough. E23 and E24 signals the drain pump relay on control board failed. E31 means the pressure sensor is not communicating with control board. An E35 code equals a pressure sensor indicating water overfill. For code E41, the control board thinks the door switch is open. E42 means the door remains locked after cycle is completed. E43 is a door-locking problem. Codes E44, E45 and E46 signal a control board problem. For E47, the board thinks the door PTC circuit is open in spin. E48 means the board thinks the door PTC circuit is closed. E52 equals a bad signal from tacho generator. E55 signals the motor overheating. E56 is high motor current. E57 is high current on inverter. E58 means high current on motor phase. E59 equals no tachometer signal for 3 seconds. The following messages are for error codes that range from E5A to EF5. Codes E5A, E5B and E5C mean high temperature on heat sink. Codes E5D, E5E and E5F signal a communication problem. E67 means the input voltage on the microprocessor is incorrect. Code E75 indicates a problem with the water temperature sensor circuit. E76 means the NTC temperature for the cold water valve is over the limits. E95 equals a communication error. EB1 signals incoming power frequency is out of limits. EB2 means the incoming line voltage is above 130 VAC. EB3 signals the incoming line voltage is below 90 VAC. EF1 means there is a clogged drain pump. EF2 indicates too much soap. Code EF5 means the NTC temperature for the cold water valve is over the limits.